The villagers have been protesting against the district administration, and have demanded compensation for the kin of deceased. Kushinagar: In yet another hooch tragedy, 10 people have died allegedly due to the consumption of illicit liquor in Kushinagar district, Uttar Pradesh. According to the sources at the Tarya Sujan police station, three people died due to the hooch day before yesterday, and seven more succumbed to the poisoning yesterday in the Javahi Dayal Chainpatti village. The police also said that over half a dozen men are getting treatment in the local government hospital, and their condition was stated to be ‘very critical’. Following the deaths, four police officers including the Tarya Sujan police station house officer (SHO) have been suspended. The Department of Excise has also suspended five of its officials including the regional excise inspector. Deceased have been identified as Deba Nishad, Hiralal Nishad, Awadh Nishad, Chanchal Chauhan, Ram Briksha, Ramnath, Vijay Prasad, Om Dixit, Santosh, Diwakar Dixit and one other. The villagers have been protesting against the district administration, and have demanded compensation for the kin of deceased. Senior officials had to intervene to bring the situation under control. The locals who were protesting alleged that the trade of hooch is flourishing these days as these people have got political backing, and the police have refrained from taking action against them. “Deceased reportedly consumed the liquor in a fair which was organised on the occasion of Mauni Amawasya,” added Mishra. Senior Congress leader Ajay Kumar Lallu demanded strict action, and has written a letter to the chief minister in which he has alleged that the hooch traders in the area have been sheltered by the police. 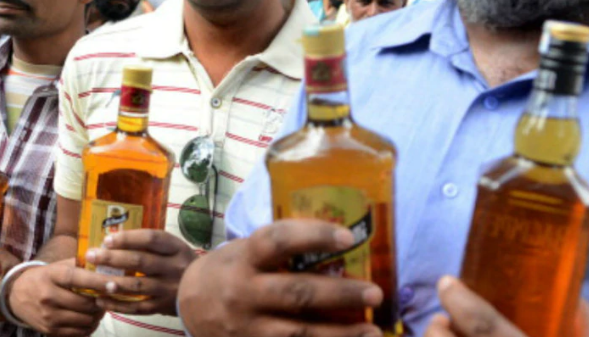 “In the past few months, several thousand litres of illicit liquor have been seized by the police, and many youths from the area, and also from some parts of Bihar have been arrested, but the real culprits are still away from the clutches of the police, which raises the suspicion that it is happening under their nose,” he wrote in his letter. It may be noted that the government of Uttar Pradesh in 2017 has passed a bill that allowed death penalty for those convicted of hooch trade.